PROFESSIONAL GRADE: These are superior quality tents for all of your growing needs. Create the perfect stable environment with total control over internal temperatures and humidity levels in your garden. MAXIMIZE YOUR LIGHT: Reflective mylar is waterproof, lightproof, nontoxic, and designed to optimize the light output of your bulbs to flood your grow room with 360 degree coverage. SEAMLESS AIR CIRCULATION: 4" and 6" dual sided exhaust vent ports circulate air throughout the tent via duct fans. Additional pest-proof vent ports on the bottom allow fresh air into the growing area without mites and other pests entering. STREAMLINE YOUR GROWING: Viewing windows with Velcro and sturdy Oxford cloth tearaway covers allow you to monitor growth with minimal interruption. Also features wide doors and a convenient, easy-access pouch for tool and nutrient storage. BUILT TO LAST: The all-in-one connecting tent poles feature built-in metal connectors, rather than inferior plastic, to withstand weights up to 100 pounds. 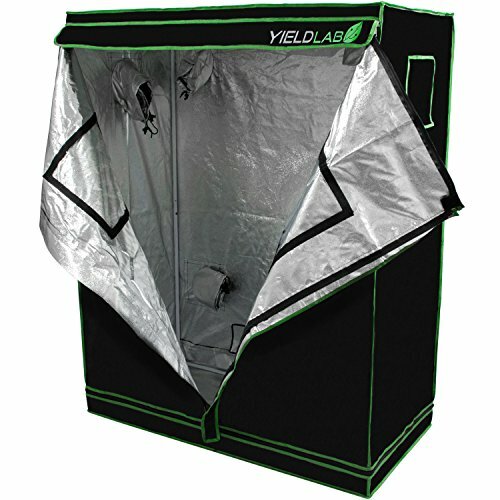 Smartbuy247 NEW 24"X24"X55" Grow Tent Bud Dark Green Room Hydroponics Box Mylar Silver! !